Freedom puppy line is specially designed to contain zero grains. And it’s for all puppies who have grain allergies or simply thrive better on this type of food. Made with high-quality and natural ingredients this food contain LifeSource bits. They are cooked at lower temperatures in order to contain all the necessary nutrients. The main ingredient here is Deboned Chicken, followed by Chicken Meal, and Turkey Meal. They provide a variety of poultry flavors puppies find delicious and create a minimum of 27% crude protein. If you suspect that your dog is allergic to chicken, this isn’t the right choice for you. Since this is a grain-free food it contains only easily digestible carbohydrates like Peas and Potatoes. They will give your puppy enough energy and keep his belly full for longer periods of time. Combined they create a maximum of 5% crude fiber, that won’t cause any gastrointestinal problems. The main source of fat is Chicken Fat combined with Flaxseed which is a source of omega 3 and 6 fatty acids. Together they create a minimum of 16% crude fat, that will keep your puppy active and his skin and coat healthy. Carrots, Parsley, Kelp, Blueberries, and Cranberries are fresh sources of vitamins and minerals. They are also supplemented in order to provide all the micronutrients your puppy needs. Calcium and phosphorus are present in the right amounts to support strong teeth and well-developed and healthy bones. Blue Buffalo also included DHA that supports brain development and good vision. Furthermore, Dried Chicory root as a source of natural prebiotic fibers for easy digestion. With 421 kcal/cup, this is a complete and balanced food that is suitable for small and medium-sized breeds. If you feel that your puppy should eat like his ancestors did, then this is the right food for you. This brand makes grain free food from high-end ingredients and novel proteins. This can be a great choice if your puppy is suffering from food allergies. The main ingredient is Salmon, followed by Ocean Fish Meal, Smoked Salmon, and Salmon Meal. They provide a variety of fishy meat flavors and a minimum of 27% crude protein. This is a great amount for well-developed muscles. Sweet Potatoes, Potatoes, and Peas are sources of carbohydrates that are easy to digest and won’t cause any allergies. Combined they make a maximum of 5% crude fiber, that will give energy and keep your puppy full for longer periods of time. The main source of fat is Canola oil, followed by Salmon oil which is a natural source of DHA. As main sources of energy, they create a minimum of 15% crude fat, that will maintain you puppy’s coat to be nice. Tomatoes, Blueberries, and Raspberries are natural sources of vitamins and antioxidants for a strong immune system. They are fortified with supplements that provide all the essential minerals necessary for a healthy growth. Omega 3 and 6 fatty acids are present to support a healthy and shiny coat. Dried Chicory root is a source of pre-biotics for easy digestion and healthy gastrointestinal system. This has been one of the best puppy foods since 2016, and with 360 kcal/cup is suitable even for large breeds. This is a limited ingredient formula that is designed for puppies that have food sensitivities. With easily recognizable ingredients and all the necessary vitamins and minerals, you know that your pup is getting all the right nutrients for a healthy growth. The main source of fat is Chicken fat, followed by Flaxseed for a healthy and radiant coat. As main sources of energy they create a minimum of 12% crude fat. This is a bit on the low side for small breed puppies that are full of energy. All the necessary vitamins and minerals are added through supplements for a strong immune system. DHA is also included for a healthy vision and brain development. Omega 3 and 6 fatty acids are present to ensure that your puppy has a healthy skin and glossy coat. With 520 kcal/cup, this is a calorie dense food suitable also for nursing and pregnant dogs. Beside this chicken flavored grain-free puppy food, Merrick has a variety of other flavors if you puppy has poultry related allergies. Made from premium quality ingredients this food is suitable for all breeds and is equipped with all the necessary nutrients a growing puppy needs. The main ingredient is Deboned Chicken, followed by Chicken Meal and Deboned Salmon. They provide a variety of healthy flavors and create a minimum of 28% crude protein. This is a great amount for well-developed muscles and enough energy. Since this is a grain-free formula it contains only Potatoes, Peas, and Sweet Potatoes that won’t cause any allergic reactions. Combined they create a maximum of 4.5% crude fiber, that is easy to digest and won’t cause any gastrointestinal problems. The main source of energy is Chicken fat, followed by Flaxseed oil as optimal providers of energy. Combined they create a minimum of 12% crude fat, that supports healthy skin and coat. Apples and Blueberries are fresh sources of vitamins for a strong immune system and healthy puppy. Merrick included all the necessary vitamins and minerals through supplements to make this grain-free food suitable for still-developing puppies. DHA is included for brain development and sharp eyesight. And omega 3 and 6 fatty acids to support healthy skin and shiny coat. Yucca extract is present in this formula in order to support healthy digestion and optimal nutrient absorption. With optimal calcium-phosphorus ratio Merrick also included Glucosamine and Chondroitin for strong bones and joint mobility. With 381 kcal/cup, this is a complete and balanced formula and one of the best large breed puppy grain free foods since it will provide a steady growth. 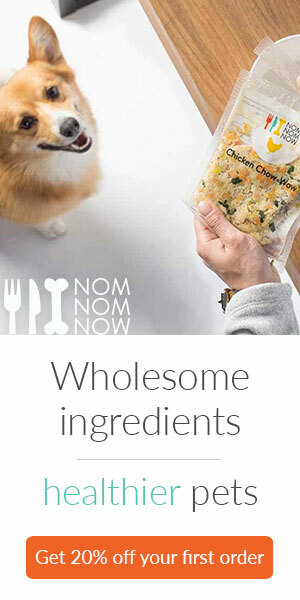 Indeed, this brand makes their foods following the philosophy that dog’s diet should consist primarily of meats. This puppy grain-free food is made with natural high-quality ingredients. And will benefit your puppy and provide a great start to a healthy life. The main ingredient is Deboned Chicken, followed by Chicken Meal and Turkey meal. These are great protein sources but if your dog has allergies on poultry you should try something else. Thus, combined they create a minimum of 36% crude protein, that is a great amount for toned and well-developed muscles. Potatoes, Peas and Ground Potatoes are sources of carbohydrates that won’t cause any allergies or problems with digestion. Combined they create a maximum of 5% crude fiber, that will keep your pup’s stomach full for longer periods of time. What’s more, the main source of fat is Chicken fat, followed by Salmon oil that is the source of DHA, and Ground Flaxseed. Combined they create a minimum of 17.5% crude fat, that is the main source of energy and also serves as skin and coat support. Bananas, Spinach, Broccoli, Carrots, Apples, Parsley, and Blueberries just to name a few support strong immune system. Moreover, wellness also included supplements in order to provide all the necessary micronutrients for a normal development and healthy growth. Calcium is present in the amount of 1.5% and phosphorus with 1.2% for strong and healthy bones. Omega 3 and 6 fatty acids are included for a healthy skin and glossy coat, and Beta-carotene for a good eyesight. Chicory root extract and Yucca extract are added pre-biotics to help with digestion and better absorption of essential nutrients. This is a complete and balanced grain-free food that is suitable for everyday feeding of still developing puppies. With 417 kcal/cup, this is a calorie dense formula that will give your pup enough energy and nutrients for healthy growth. You should consider your puppy’s breed to find out the perfect ratio for him. The best grain free large breed puppy food will have a ratio of 1:1 to 1:1.8. This will help the bones of large and giant breeds can develop nicely and be strong. Since small breed puppies need less time to grow up and are more active, they need a calorie rich diet. For large breeds look for a specially designed puppy food that has fewer calories for a steady growth that won’t cause hip dysplasia. There is no doubt that zero grain diet has health benefits even if your puppy isn’t allergic to them. But we still advise you to talk to your vet prior to transitioning your puppy onto this type of food. And for all of you who are wondering what is the best grain free puppy food, we reviewed 5 formulas that contain all the necessary nutrients a still growing puppy needs. Puppies are energetic and still developing so they need special amounts of nutrients to fuel them. That includes carbs as sources of energy as well. Special considerations when it comes to puppy food is that it needs to have all the vitamins, minerals, and omega fatty acids. They are necessary for a proper brain, eye, and bone development. The most common culprits when it comes to grain allergies are wheat, corn, and soy. They are hard to digest and shouldn’t be present in your puppy’s food even if he doesn’t have allergies. What Are The Benefits Of This Type Of Diet? The best grain free puppy food is made from more meat, and contains higher levels of proteins that are essential for a still-developing puppy. Refined grains are harder to digest and can cause gastrointestinal problems. When you are feeding your puppy with whole or no grains, he won’t experience stomach problems like diarrhea and gases. Beef, poultry, dairy, and fleas are most common sources of allergies in puppies. Still some puppies can develop grain allergies. In this case, your only option is to change your pup’s diet onto a grain free food. Too much grains can make your puppy overweight and even obese. Some manufacturers even list grains as their main ingredient. If your puppy has predispositions to become obese it is better to switch him onto a grain free formula. What Are The Signs Of Allergies? On occasion, our suggestions for high-quality pet products will direct you to our partner site(s), where we may earn a small commission, which financially supports further development of Pet.Reviews.